After a weekend where plenty of characters and lots of air time (including some of my own) was used dissecting what the deadline for a contract extension laid down by Yadier Molina meant, yesterday Jon Heyman reported that significant progress had been made toward that extension, giving Cardinal fans hope that perhaps a deal could be reached by Opening Night after all. A topic that seemed to have stalled all winter long seems to have finally picked up steam. Whether that’s a correlation to the recent media press Yadi and his brother Bengie Molina have put on the Cardinals or just coincidental timing, I don’t know nor is it really important. The important thing is that the club and the catcher are talking about keeping him around. Again, I get that completely. Almost every time, that’s what you want to see out of your front office. You don’t want to see them spending willy-nilly on everybody that’s played in your team’s uniform. You don’t want them just throwing around money like StlCardsCards throws around insults. You want a smart, disciplined front office to make sure your team is competitive year in and year out. Which the Cardinals have! There’s a reason they’ve been the most successful National League team (and perhaps the most successful MLB team) over the past two decades. While they’ve offered some big contracts that haven’t been accepted, they’ve also not just given a blank check to players, whether it is folks they want to entice (David Price), folks they’d like to retain (Jason Heyward), or folks that are franchise icons (Albert Pujols). I’m not suggesting that they make a significant change in their operating procedure. Jhonny Peralta will have been here four years at the end of the season, but you don’t hear anybody saying that they should back up the vault truck to try to keep him. To borrow some imagery from Cassie’s latest blog post on Kolten Wong (a post you should read and a topic I’ll try to get to in this space soon, though Tara did a pretty good job covering it on Gateway), Yadi sits the intersection of Iconic Drive, Available Money Lane, and Short-Term Deal Parkway. It’s an intersection that, frankly, nobody else has been at in a long while. Pujols was iconic, but his deal wasn’t going to be short-term and could have really bogged down the payroll for a long period of time. Nobody else has risen to that level. Perhaps the last player that you could say this about was Chris Carpenter, who signed a two-year extension worth $21 million in the afterglow of his amazing 2011 postseason. Obviously, that didn’t work out great for the Cardinals, but I have never heard anyone complain about the fact Carpenter ended his career with the Cardinals, even if the money would be technically deemed money ill spent. That gets us back to our friends at Rum Bunter. What does love have to do with it? Should emotion play any part in a front office’s approach to a player? Are they going against their “fiduciary duty” (as it were) when they aren’t completely analytical with how they spend their money? The Cardinals are awash in cash and they’ve not even started the new $1 billion FOX Sports Midwest deal yet (that kicks in next year). Viva El Birdos looked at the upcoming salaries in December (before the Carlos Martinez extension) for the next five years. Zach Gifford of Redbird Rants and The Redbird Daily had a more up-to-date one for the next three seasons that he shared on Twitter and I’m shamelessly stealing to put in here. 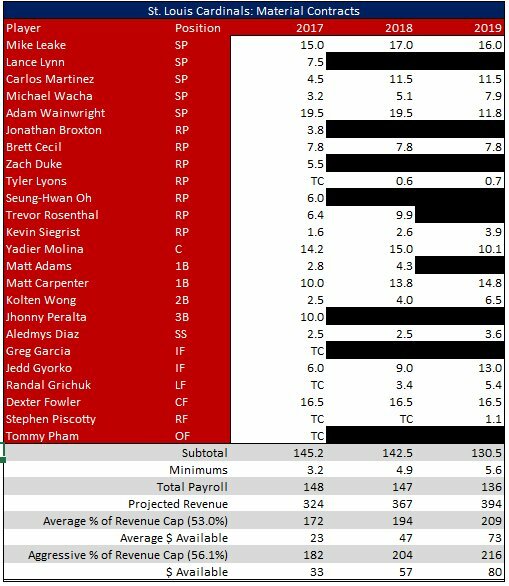 Zach has some estimates built into this (obviously Yadi doesn’t have anything for 2019 yet, nor does Adam Wainwright) but it’s a good place to start. Right now the Cardinals (according to this site) rank right in the middle of the pack when it comes to payroll. Obviously you have to factor in some factors, such as market size and the like, but it’s not unreasonable to think they could support a payroll that was more like the fifth or sixth highest in the game with the devoted fanbase, the new television contract, and all their ancillary avenues of revenue such as their share of MLBAM, merchandising, etc. When you are pinching pennies, of course you can’t let emotion flow into your decision making. You have to get the most out of your dollar that you can. As I’ve said, all front offices should do that, but there are rare times like this that when you have the extra money, you can afford to be a little sentimental. Front offices are made up of people, after all, and that’s what people do. It’s the whole entire reason that there’s a site like ThinkGeek. If you want to get the most out of your money and be completely practical, you aren’t buying the R2-D2 popcorn maker. If you love Star Wars and popcorn, though, and have the extra cash, you might splurge. You can’t clean out the front offices and let a simulation game like OOTP18 take over. There are humans running a team for the benefit of other humans and that’s great. You have to be able to recognize the intangibles of what a player like Molina gives you, something that a spreadsheet can’t calculate. I don’t want this to seem a rehash of the old sabermetrics versus scouting/gut feeling battle, because it’s not, but what John Mozeliak has done a great job of is marrying the analytics to the human. Those thoughts, those emotions, have to play a role. And it’s not like the Cardinals are trying to extend a broken-down has been just because he’s got ties to the organization. Yadier Molina, at least right now, can still play. Will he be able to do that for the next three years? That’s a gamble. But right now, given how he played in the second half of last year and his stellar performance in the World Baseball Classic, Molina still has the profile of a starting major league catcher. If a contract gets done, it’s not entirely a sop to the fanbase and a long-time employee. Not only that, but there’s a value to having Molina around while a new generation of young pitchers is making its way to Busch Stadium. You can discount the legend of Yadier Molina, Pitcher Whisperer by 25% and you still have a remarkable teacher and player with insights on the game. The mind of Yadi has as much to do with the player that he is than any physical attributes. What price do you put on that? How do you include that variable into what you offer him? Then factor in all the jerseys, shirts, and other memorabilia that you can sell forever if Molina ends his career as a Cardinal. Sure, you see Pujols and others around the ballpark, but when was the last time the clubhouse store sold a Pujols shirt? I can’t imagine they’ve stocked them since 2011. Yet you can find Ozzie Smith, Lou Brock, Stan Musial, and the like. If a player can end their career in St. Louis as a beloved figure, the club is going to be able to make money off of it over the long haul. There’s a financial benefit to locking up Yadi as well. I don’t know if this is going to get done. The Cardinals are usually pretty secretive about their contract dealings, so having this leak out is a little strange. Perhaps it’s their way of putting it more on Molina if things don’t get done. Perhaps they did feel the fan heat–Yadi’s the rare player that I’ve heard sabermetricians and casual fans agree should be paid, whatever the deal requires–and they are letting folks know they are making a late push. All I know is that if the contract gets done, it might not be the most business-savvy move, it will likely be a deal Molina can’t live up to, and it will definitely have us discussing Carson Kelly‘s future. (I still hope for the graduated transition we talked about in December.) I do know that keeping Yadi in St. Louis is not going to torpedo the club and will allow the fans to enjoy the entire career of a legendary player, a player they love. I’m fine with that. Every once in a while, you have to do something at least somewhat illogical. Helps prove you’re human, I think. It’s not logical that we love this game and these players like we do. Occasionally, it’s fine if the front office remembers that. This is one of those times.